The famous period in Chinese history known as the romance of 3 kingdoms continues to be a incredibly popular theme with manufacturers and gamers alike. Sangokushi Taisen 2 or Great War is a combination of action, strategy and card collecting. The player buys cards to play with, these cards include warriors, weapons, items and tactics. 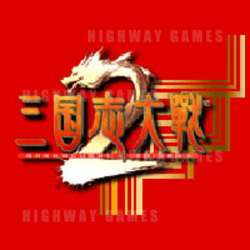 The player uses these cards and the controls their actions via gaming station, to fight a war to gain control of the various provinces of china. Of course having the card elements does give more of a advantage to the player if he has a strong deck. As some cards are rarer than others, this encourages the player to play more and buy more. On screen the gamers can control the action and give orders and position troops. The mechanics of battle follow the classic rock - paper - scissors formula. As in archers beat spearman, spearman beat calvary, calvary beat archers. Of course army size, strength and tactics can alter this somewhat. The game itself has a unique input system where the cards are placed on a playing field, where the game will recognise. Movement in-game is done by moving the cards on the playing field.